This tripod features a collapsible center staff with a twist locking mechanism that rotates 360° to check the calibration of plumbing with an 8-minute vial, and quick release & twist locking mechanisms on the legs. It is dual graduated and adjusts to three heights: 2 m, 1.8 m, and 1.5 m. It collapses to 50 inches (127 cm). Other features include a removable 5/8 x 11 adapter and an onboard compass. 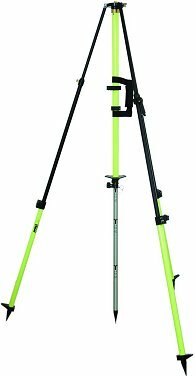 The extendable tripod legs and the pole are electrostatically powder painted and include replaceable points. The aluminum hardware is anodized black. Weighs 15 lb (6.8 kg).